If you’re looking for a new career that offers rewarding work, great benefits and helpful colleagues, then consider joining us at Everett Toyota of Paris. We’re always on the lookout for talented, hard-working people to join our team, so if you fit the bill, we’d love to hear from you! 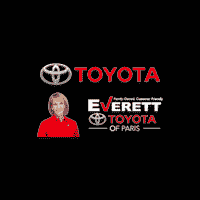 At Everett Toyota of Paris, we offer competitive salaries and excellent benefits that we think you’ll appreciate. We also strive to create a friendly and helpful work environment that allows our employees to thrive. When you work with us, you can expect a challenging yet enjoyable career with friendly, helpful colleagues who make each day at work a great one. We’re always looking for talented people like yourself to help in different positions. Visit us in person, to find the position that’s right for you. Whether you’re interested in a job in our service center, sales departments, finance department or elsewhere, we would love to hear from you. If you don’t know exactly what suits you, you’re welcome to bring us a resume anyway; we’re always looking to hire enthusiastic, hard-working people like you. When you’re ready to get started on a fulfilling career and you think Everett Toyota of Paris is the place for you, stop in and see what positions are available. You’re welcome to apply whenever you’re ready. We can’t wait to hear from you!